I was reminded recently, when listening again to the first episode of Tim Elliott's great new Unfiltered podcasts, a roundtable format that he's introduced with guests from the blogosphere and the wine business, that I used to love zinfandels. 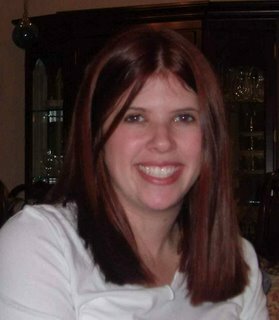 If you check my posts from the last few months, though, you will see I don't drink much zin these days. Why? Too much alcohol, too much jammy fruit, and too much extraction. Not to mention too much headache the next morning. The guys on the podcast were lamenting the same changes, and remembering the old style zins with real nostalgia. Is anyone making a zin like they used to be, I wondered? One that was round and yet peppery, fruity but with a brambly edge. And, one that doesn't knock you over with its power. So I went to the store in search of a lower alcohol zinfandel that might remind me of the wines I drank through the 90s. After turning around what seemed like every zin on the shelf, I found one that came in at just 13.5% alc/vol. 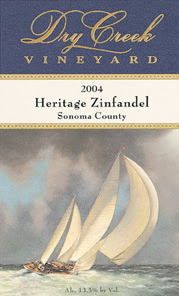 The 2004 Dry Creek Vineyard Heritage Zinfandel ($15 direct from the winery; check Wine Zap for lots of other merchants who are selling it for $11-$18) reminded me of the way zins were. An old-school Zin, with only 13.5% alch/vol, this is a subtle, smooth wine with textbook zin characteristics. Blended from 84% Zinfandel and 16% Petite Sirah grapes, it is dark, inky purple in color. Potent aromas of spice and blackberry come from the glass before you take your first sip. These aromas are followed up by blackberry, huckleberry at first taste, then waves of woody, brushy flavors and freshly cracked pepper. This wine had bright acidity and a long, juicy finish. Not a jam pot in sight! This was the kind of wine that made me love zinfandel, and I haven't had one like it for years. It represented excellent QPR, especially if this is the style of zinfandel you long for and rarely find these days. With my zinfandel I had a simply grilled steak; a salad made with baby lettuces, red beets, a splash of balsamic vinegar, and olive oil; and some toasted baguette with goat cheese. Beef and zinfandel are a natural pairing, and the beets picked up the woody flavors in the zinfandel. I'll be on the lookout for more zinfandels like this, and perhaps continue to scan the shelves for zins with lower alcohol to see if that is a consistent clue that helps me to find the brambly, peppery wines that remind me of the way zins were. It has a little more alcohol than, at 14.5%, but we drank a 2004 Quivira Zin the other night that has the same qualities you are describing. In fact, I have a post all ready to go about it that I was planning to put up this afternoon. However, I like both styles of zins, but don't tend to like the big zins for my dinner since they take over the meal. Hi Sonadora! I've never had the Quivira zin--just their rose, which I like a lot. I'll keep my eyes out for it. Zins are great this time of year, aren't they? But boy I just can't drink those high alcohol monsters! Some are ridiculous. Once it starts creeping up to 16%, I can only handle a glass or two, but I love them! One of my good friends was telling me about one she brought back from Napa that checks in at 19.1%!! I can't even imagine how that one is. I love my zins in the winter....but spring is rearing its head here so I'm looking forward to some more whites and roses coming up. I saw you mention on another blog comment that you frequent a shop in Pasadena. My husband is from La Canada and his parents still live there, so we are out that way from time to time! 19.1%! I can't even imagine. I could have two sips and then would instantly fall asleep. La Canada is just up the road! Lost of good wine bars and stores out here next time you're out this way.